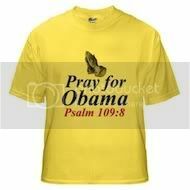 For the past year and a half or so, droves of right wing Christian websites have been selling a variety of "Pray for Obama" items -- t-shirts, bumper stickers, hats, and even teddy bears -- all sporting the slogan "Pray for Obama" followed by the Bible verse reference "Psalm 109:8." Psalm 109 is what's known as an imprecatory prayer -- a prayer to invoke evil, misfortune, or physical harm upon someone. The words of Psalm 109:8 are: "Let his days be few; and let another take his office." The next line is "Let his children be fatherless, and his wife a widow." As Frank Shaeffer, appearing on Rachel Maddow back in November 2009 when this "Pray for Obama" merchandise was first becoming popular, explained: "[T]here is a crazy fringe to whom all these little messages that have been pouring out of Fox News, now on a bumper sticker, talking about doing away with Obama, asking God to kill him. Really, this is trolling for assassins." In an effort to determine "if the design was simply intended to be criticism of the President or something much worse," CafePress posted an online poll, and found that: "General consensus has proven that the design does point to a broader interpretation of the Psalm and thus has been deemed inappropriate for sale at CafePress." Zazzle.com also banned the slogan, issuing a statement saying they had "determined that these products, in the context of the full text of Psalm 109, may be interpreted in such a way as to suggest physical harm to the President of the United States." But the banning of the slogan by mainstream websites like CafePress and Zazzle hasn't slowed the sale of 'Obama Prayer' merchandise on right wing Christian websites or the slogan's popularity. "When Sergeant Martha Nash reported for duty at the Manatee County, Fla., Sheriff's Office on Sept. 29, she said she found her copy of the New Testament lying on the desk with a peculiar note sticking out from inside. "'The Obama Prayer,' it read, in an unrecognizable, handwritten scrawl. "But when Nash looked to the relevant passage, circled with a pink highlighter, she said she was shocked by what it said. The text seemed to suggest that whoever left it wanted President Obama dead." "Sgt. Matthew Neu, who was known to oppose Obama politically, told investigators he received an e-mail referencing a bumper sticker with Psalm 109 and the "Obama prayer," then left the Bible and note on Nash's desk. Almost six months before it surfaced that the right wing Christians were promoting Psalm 109 as a prayer for Obama, this same imprecatory prayer was publicly issued by disgraced former Navy chaplain Gordon Klingenshmitt against Mikey Weinstein, the founder and president of the Military Religious Freedom Foundation (MRFF), and Barry Lynn, the head of Americans United for the Separation of Church and State (AU). Both MRFF and AU had been contacted by numerous people about Klingenschmitt's use of the Navy uniform and title of Chaplain on his political website, prayinjesusname.org. To address the issue, MRFF and AU wrote a joint letter to the Chief of Naval Operations requesting an investigation of Klingenschmit'ts use of his image in uniform to solicit funds for political causes. "Let us pray. Almighty God, today we pray imprecatory prayers from Psalm 109 against the enemies of religious liberty, including Barry Lynn and Mikey Weinstein, who issued press releases this week attacking me personally. God, do not remain silent, for wicked men surround us and tell lies about us. We bless them, but they curse us. Therefore find them guilty, not me. Let their days be few, and replace them with Godly people. Plunder their fields, and seize their assets. Cut off their descendants, and remember their sins, in Jesus' name. Amen." Klingenschmitt also posted a very strange disclaimer on his website, in which he defended his right to call himself "Chaplain," stating that he had a current endorsement as a "Chaplain and Evangelist to America" from the Chaplaincy of Full Gospel Churches (CFGC). It was this statement that led MRFF to take a closer look at the CFGC, a chaplain endorsing agency founded by retired Army colonel and chaplain Jim Ammerman, and authorized by the Department of Defense to provide the ecclesiastical endorsement required by the military for all military chaplains, with several hundred of its chaplains currently serving in all branches of the military. It didn't take long to find out that Jim Ammerman was a dangerous conspiracy theorist with a long record of making statements to foment anti-government sentiment and incite violence as a speaker for the Topeka, Kansas based Prophecy Club, an organization that promotes a plethora of conspiracy theories against the U.S. government -- everything from 9-11 being a government conspiracy to the United States being in imminent danger of being placed under the control of U.N. forces to the entire U.S. government being an illegal government founded by the Illuminati and satanists. In fact, way back in 1997 a three-star general had called for an investigation of Ammerman and CFGC with a memorandum including nine pages of excerpts from Ammerman's radio appearances and his Prophecy Club video, "Imminent Military Takeover of the U.S.A.," a video being circulated among militia groups at the time. Ammerman's statements included everything from saying that Bill Clinton (president at the time the video was released) should have been executed to inciting the militia types by making claims that his chaplains were reporting back to him that they had inside information that the U.S. military was preparing to attack U.S. cities, and claiming inside information from other sources indicating an imminent threat of the United States being placed under martial law. Ammerman's more recent statements include a "suggestion" in his September 2008 CFGC newsletter that the four democratic senators who were then candidates for president -- Hillary Clinton, Joe Biden, Chris Dodd, and, of course, Barack Obama -- should be arrested and executed for voting against making English the official language of the United States. He has also advocated armed violence against law enforcement officials. Ammerman has also allegedly slandered Mikey Weinstein and his family. In one speech, describing a meeting he had had with a U.S. senator during which the senator asked him how the chaplains praying in Jesus' name controversy got started, Ammerman claimed that Weinstein became a "madman" because one of his sons, both of whom are Air Force Academy graduates, "got saved" at the Academy. (Ammerman's claim about Weinstein's son is completely untrue, as is his claim that Weinstein is a multi-millionaire who's getting other Jews to give him money). "He [the senator] said, 'this big question about the name of Jesus, where did it start?' And I said, 'In the Air Force -- the Air Force Academy, in fact, by a Jew who had two boys there. He was a graduate from there and became a lawyer -- a real estate lawyer -- and he's a multi-millionaire and he's getting other Jews to give him money to stamp out the name of Jesus throughout this nation. But, one of his two Jewish sons got saved up there and he's been a madman ever since. He should come -- and I pray God will enlighten him and say your son's not on the road to hell any longer, and if I get a chance to meet him, I will say, 'Do you know how happy you ought to be. One of your sons is on the road to heaven.' Now, he might slug me because he'd turned into a madman at that point, but I'll take a lick for Jesus. In fact, if he broke my neck and I died, I'd be in the instant presence of Christ, and I'm sure Jesus would have a little smile on his lips when I reported in." In September 2009, Mikey Weinstein and his wife Bonnie filed a lawsuit against Gordon Klingenschmitt, Jim Ammerman, and the Chaplaincy of Full Gospel Churches. This is not a MRFF lawsuit, but a suit brought by the Weinsteins personally. The lawsuit seeks an injunction restraining the defendants from "making further terroristic threats" or "encouraging, soliciting, directing, abetting, or attempting to induce others to engage in similar conduct or to harm Plaintiffs or their family." In other words, the Weinsteins, who have already been subjected to numerous death threats and attacks on their home, want the court to stop Gordon Klingenschmitt from "trolling for assassins," as Frank Shaeffer described it when talking about the danger of disseminating imprecatory prayers against an "enemy" to an audience that could include any number of unstable individuals who might take these prayers literally and act on them, thinking they're doing God's work. The Weinsteins' lawsuit was filed in Dallas County, Texas because this is where Jim Ammerman resides, and where the CFGC, Klingenschmitt's chaplain endorsing agency, is located. Klingenschmitt, a resident of Colorado, answered by filing a "special appearance" (a hearing to dispute the jurisdiction of one state's court over a defendant from another state) in the Dallas County court. Klingenschmitt also filed a motion to dismiss the case. The Dallas County court found that, under Texas court rules, by filing this motion to dismiss the case on its merits, Klingenschmitt had already entered a "general appearance," thereby waiving his "special appearance." So, Klingenshmitt's "special appearance" was denied. Klingenschmitt appealed this decision. On Friday, March 18, the Court of Appeals, Fifth District of Texas at Dallas, upheld the Dallas County court's decision, agreeing that: "In addition to its finding of fact that Klingenschmitt has extensive and systematic contacts with Texas and its conclusion of law that Klingenschmitt has continuous and systematic contacts with Texas, the trial court concluded that Klingenschmitt's motion to dismiss and motion for reconsideration of the motion to dismiss sought dismissal of the Weinsteins' claims on the merits and that Klingenschmitt waived his special appearance." Barring any further attempts to throw up procedural roadblocks, Friday's ruling by the Court of Appeals means that the lawsuit against Gordon Klingenschmitt, Jim Ammerman, and the Chaplaincy of Full Gospel Churches will move forward in the Dallas court, and it will now be up to jury to decide if recklessly issuing imprecatory prayers against an individual or individuals, whether it's a private citizen like Mikey Weinstein or the President of the United States, is a potential incitement to violence or protected free speech. Chris, your research and reporting are always succinct, informative, and greatly appreciated. I would consider this use of the psalm 109 message a form of leaderless resistance. Would that be correct? And if it is, do you know any studies relating to the effectiveness of this strategy? Leaderless resistance is exactly what this is. I don't know if any studies have been done on it. It seems like it would be a kind of hard thing to track the effectiveness of since leaderless resistance is, by its very nature, so unorganized. Psalm 109 is what's known as an imprecatory prayer -- a prayer to invoke evil, misfortune, or physical harm upon someone. It also sounds like something the Santeria community would espouse....and this is coming from a former out pagan, and present agnostic. Gendered Discourse is in play when ever and where ever supposed 'mainstream' Christianity is used as a substitute for secular Democracy. Cynicism is the attempt to compensate for lack of intellect and wit. ...Can't explain the death of the Assistant Director of the FBI at the Twin Towers who happened to be the first to lobby to put Bin Laden on the Terrorist Watch List. Other than that, government doesn't concern me, mostly. But, if I were to cast stones at people for 9/11, it'd be the Evangelicals in the government, not the full government. was a NYC employee, head of the city anti-terrorism emergency unit - whose office was in one of the World Trade Center towers. Blame NYC for putting its anti-terrorism security office in the WTC. O'Neill just went to his daily workplace. There was a very long article about o'Neill in the New Yorker in 2002 or thereabouts.